The state of Lu 魯 was a regional state of the Zhou period 周 (11th cent.-221 BCE). As a small state in the eastern fringes of the Central Plain, it had always to cope with the ambitions of the larger states of the south and the north, especially Qi 齊 and Chu 楚. Lu was the home state of the philosopher Confucius 孔子. Lu was located in the southwestern part of the modern province of Shandong, around Qufu 曲阜. Map according to Tan Qixiang 谭其骧 (1987), Zhongguo lishi ditu ji 中国历史地图集. Lu was located in the eastern parts of the Yellow River Plain, at the foot of Mt. Taishan. It was the home state of Confucius. It survived the Spring and Autumn period, but was internally weakened and was conquered by the southern state of Chu. Click to enlarge. The first lord made regional ruler over the territory of Lu was Ji Dan 姬但, the Duke of Zhou 周公, brother of King Wu 周武王, the founder of the Zhou dynasty. The Duke of Zhou was later revered as a person of high moral integrity who represented all virtues held high by Confucius and his school. He was therefore at an early point of time often consulted by his older brother and so practically became the first Counsellor-in-chief in China's history. Ji Dan also participated in the campaign of his brother against the king of the Shang dynasty 商 (17th-11th cent. BCE) and commanded part of the army at the battles of Mengjin 孟津 and Muye 牧野. He is credited with the authorship of the "Speech at Muye" (Mushi 牧誓), which now constitutes a chapter of the Confucian Classic Shangshu 尚書 "Book of Documents". After the death of the king of the Shang dynasty, Ji Fa 姬發 proclaimed himself king of the Zhou dynasty (King Wu is his posthumous title). Ji Dan was appointed Duke of Zhou, a title that corresponded to the office of Counsellor to the Right, and his younger brother Ji Shi 姬奭 as Duke of Shao 召公, the Counsellor to the Left. Both remained at the court of their brother to perform their duties in the central government. The state of the Duke of Zhou was the territory of Lu, that of the Duke of Shao the territory of Yan 燕. Lu was the region around the town of Qufu that is said to have been the ancient site where the mythological emperor Shao Hao 少昊 (Di Zhi 帝摯) had resided, a place called Yan 奄. A third important person supporting the king in the central government was the "Great Duke" (taigong 太公) Lü Shang 呂尚, who reigned over the territory of Qi 齊. King Wu soon fell ill. In this precarious situation the Duke of Zhou refused to perform the traditional mantic rituals in order to know more about the outcome of the disease and instead erected three altars on which he declared to the ancestors of Zhou that he was willing to take over the disease and eventual death of his older brother. A subsequent investigation of the forefather's answer brought to light that they accepted the self-offering of Ji Dan. The record of the oracle was enclosed in a golden coffer (jinteng 金滕). The newly founded kingdom of Zhou encountered first political problems when King Wu died. His son, Ji Song 姬誦 (posthumously called King Cheng 周成王, r. 1116-1079 BCE), was still under age, and therefore the Duke of Zhou decided to act as regent until the king became mature. Three other brothers of the Duke of Zhou, Guan Shu Xian 管叔鮮, Cai Shu Du 蔡叔度 and Huo Shu Chu 霍叔處, charged him with the crime of attempting to usurp the throne. The three brothers joined with Lu Fu 祿父 (called Wu Geng 武庚), a son of the last king of Shang who had been made regional ruler (zhuhou 諸侯) residing in Chaoge 朝歌, and rebelled against the Duke of Zhou. The rebels controlled the territory southeast in region of the River Huai 淮 and were supported by the native peoples of this area. The Duke of Zhou proclaimed the Dagao 大誥 "Great announcement" and personally led the troops of Zhou against the rebels. Wu Geng and the Duke of Guan were executed, while the Duke of Cai 蔡 was pardoned. The subjects of Wu Geng, actually nobles of the former Shang dynasty, were settled down in the territory of Song 宋, and another son of the last king of Shang, Weizi 微子, was made regional ruler of this land. The former territory of Wu Geng, the land of Wei 衛, was given to Uncle Feng of Kang 康叔封, yet another brother of the Duke of Zhou. It took the Duke of Zhou two years to pacify this rebellion and to put down the unruly natives of the regions Huai (the Yi barbarians of the Huai 淮夷) and Xu 徐 (the Rong barbarians of Xu 徐戎). In order to secure the eastern region, a secondary capital was founded in the east, the city of Chengzhou 成周 (Luoyi 雒邑, modern Luoyang 洛陽, Henan). The Duke himself undertook the important task to determine an auspicious place for this city. For seven years the Duke of Zhou acted as regent for King Cheng and then rendered the "sceptre" back to the young ruler. Many proclamations were issued by the Duke of Zhou during these years, part of which has survived as chapters in the book Shangshu. The Duke died in the capital residence of Fengjing 豐京 and was buried in Biyi 畢邑, not far from the mausoleum of his father King Wen. Tombs of his descendants are found in Zhougongmiao 周公廟 in Qishan 岐山 close to Baoji 寶雞, Shaanxi. During all these years, the state of Lu was administered by "Uncle" Bo Qin 伯禽 (also known as Qin Fu 禽父 "Father Qin"), a son of Ji Dan. The eminent position that the Duke of Zhou had occupied allowed the subsequent dukes of Lu to be the sole regional state that was allowed to perform the ancestral rites to venerate the former kings of Zhou. It was therefore also the only state where royal rituals and music were allowed to be performed. Lu also served as a military stronghold to control the native peoples in the east. Duke Wu of Lu 魯武公 (r. 825-816) and his two sons Kuo 括 and Xi 戲 visited the capital. King Xuan of Zhou 周宣王 (r. 828-782 BCE) preferred the younger son, Prince Xi, as successor to Duke Wu, but his ministers argued that this would contradict customs and rituals and an interference in favour of Prince Xi would undermine the moral authority of the house of Zhou. Yet King Xuan ignored the warnings of his ministers and, after the death of Duke Wu, made Prince Xi the new duke (posthumously known as Duke Yi 魯懿公, r. 816-807). Duke Yi was in the end killed by adherents of Prince Boya 伯御 (a special reading instead of Boyu), a son of Prince Kuo. Prince Boya was made the new duke (r. 807-796). King Xuan hesitated for a long time, but in the end he decided to stage an attack on the dukedom of Lu and killed Prince Boya, who was officially called a usurper. The king had the nobles of Lu select their next ruler, and they chose Prince Cheng 稱, a son of Duke Yi, because of his moral behaviour. The king consented and appointed Prince Cheng the new duke of Lu (posthumously known as Duke Xiao 魯孝公, r. 796-769). This interference of the kings of Zhou into the question of succession in the state of Lu was also the last great activity of the house of Zhou. 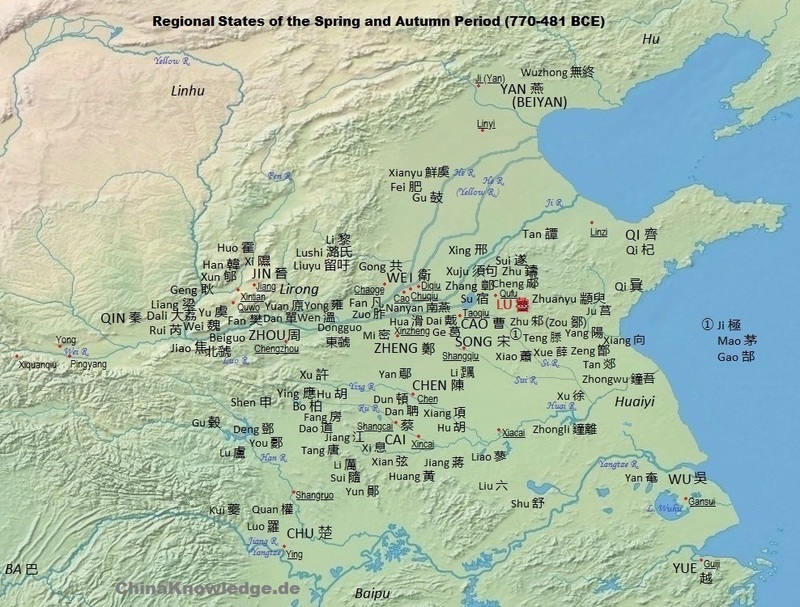 The Zhou dynasty was soon forced to give up its western capital and withdrew to the eastern capital, deprived of revenues and authority. When Duke Hui of Lu 魯惠公 (r. 769-723) died, an inferior son of his, Prince Xigu 息姑 (or Xi 息), took over regency (r. 723-712). He is the first of the dukes of Zhou whose reigns are covered in the so-called Chunqiu 春秋 "Spring and Autumn Annals", the chronicle of the state of Lu. Prince Xi was the son of Shengzi 聲子, a concubine of Duke Hui. When he was of age, Duke Hui engaged him to a princess of Song, but the girl was so beautiful that the Duke took her in his harem and then promoted her to the position of lady (furen 夫人). She bore a son, Prince Yun 允, who was, although much younger, the righteous apparent to the throne. Prince Xi therefore saw his own position as that of a regent rather than that of a proper duke. In the tenth year of his reign Prince Hui 揮 (Yu Fu 羽父) suggested to him getting rid of Prince Yun and adopting the title of duke, but Prince Xi refused. Prince Hui thereupon feared the revenge of Prince Yun and slandered the regent, saying that Prince Xi planned to kill Prince Yun. Both prepared the assassination of Prince Xi who was finally killed during a sacrificial ceremony. Prince Xi was nevertheless granted the posthumous title of Duke Yin 魯隱公. Prince Yun, also called Prince Gui 軌, mounted the throne. He is posthumously known as Duke Huan 魯桓公 (r. 712-694). Duke Huan was able to take control over the small states of Zhu 邾, Ji 極 and Fang 防 and forced Cao 曹, Teng 滕, Xue 薛 and Ji 紀 to pay homage. Duke Huan was married to a princess of the state of Qi and therefore undertook a visit to her home country in 694. The princess, his wife, had an illicit relationship with her cousin, Duke Xiang of Qi. When Duke Huan of Lu was informed about this affair, Duke Xiang of Qi took action and had the cuckold killed in his coach way back from a banquet. Charged with the crime, Duke Xiang had the murderer Peng Sheng 彭生 executed, but no further excuse was given to the house of Lu. Duke Huan was succeeded by his son, Prince Tong 同, who is posthumously known as Duke Zhuang 魯莊公 (r. 694-662). His mother, the princess of Qi, did not dare to return to Lu. Duke Huan as well as Duke Zhuang took part in the alliances common at that time and supported the dukes of the smaller states in their neighbourhood against rebellions and dynastic strife. In 687, Prince Jiu 糾 of Qi took refuge in Lu. Duke Zhuang supported Prince Jiu as a claimant to the throne of Qi, but Duke Huan of Qi 齊桓公 (r. 685-643 BCE) was the successful pretendant. He attacked the state of Lu, so that Duke Zhuang of Lu could not but kill Prince Jiu. The Prince had been accompanied by Guan Zhong 管仲, whom Duke Zhuang planned to send back to Qi. He was advised by Shi Bo 施伯 not to do so because Guan Zhong was a very competent person, but the Duke did not accept his advice. Guan Zhong finally became counsellor to Duke Huan of Qi and made Qi the most powerful state of his time. Under the reign of Duke Zhuang the house of Lu diverged into several branches that eventually contended for supreme power in the dukedom. Duke Zhuang had three younger brothers, Qing Fu 慶父, Shu Ya 叔牙, and Ji You 季友. Duke Zhuang's main consort, Ai Jiang 哀姜 (I), a princess of Qi, had not borne a son. Her younger sister, Shu Jiang 叔姜, was the mother of Prince Kai 開. Another concubine called Meng Nü 孟女 from the family Dang 黨 had given birth to Prince Ban 斑 (also written 般), Duke Zhuang's most beloved son, to whom he planned to inherit the throne. When the Duke fell ill, Prince Shu Ya argued that the house law of Lu regulated that only a son of the main consort was allowed to succeed, otherwise a brother was to be the next duke. Yet Duke Zhuang did not like Prince Qing Fu and followed the plan of Prince Ji You, according to which Ji You would enthrone Prince Ban. Prince Shu Ya was forced to drink poison, with the promise that otherwise he would not be venerated in the ancestral hall. Duke Zhuang appointed his favourite son, Prince Ban, heir of the ancestral line of Prince Shu Ya that was called that of Shusun 叔孫. When Duke Zhuang died, Prince Ban was indeed enthroned, but he resided in the mansion of his mother's family and not in the ducal palace. Ban's half-uncle Qing Fu had an affair with Duchess Ai Jiang and planned to enthrone her nephew, Prince Kai. He had Prince Ban assassinated, forced his brother Ji You into exile, and enthroned Prince Kai, who is posthumously known as Duke Min 魯湣公 (also written 魯閔公, r. 662-660). Duke Min found out about the affair of his mother with Qing Fu, and the latter had the duke killed. Ji You was able to assemble supporters at the court of Lu, so that Qing Fu was forced to flee to the statelet of Ju 莒. Ji You invited Prince Shen 申, a brother of Duke Min, and enthroned him as the new duke of Lu. He is posthumously known as Duke Xi 魯釐公 (also written 魯僖公, r. 660-627). Qing Fu was compelled to commit suicide. His lover, the duchess, was captured by Duke Huan of Qi and was executed for the shame she had brought on her family. Duke Xi had his aunt buried in Lu with ducal honours. Ji You was made counsellor of Duke Xi and became ancestor of the line Jisun 季孫. The descendants of Qing Fu were the line Mengsun 孟孫. The three lines Shusun, Jisun and Mengsun are also called the "Three Huan" (San Huan 三桓) because their originators were sons of Duke Huan of Lu. Under the reign of Duke Wen 魯文公 (r. 627-609), the power of the three sidelines continued playing a great role. The Duke had two wives, Duchess Ai Jiang 哀姜 (II), also a princess of Qi, who gave birth to the princes Wu 惡 and Shi 視, and Jing Ying 敬嬴, who was the mother of Prince Sui 俀. The latter had a good relationship with his uncle, Prince Xiang Zhong 襄仲, who promised to make him duke, although he was only the son of a concubine. Counsellor Shu Zhong 叔仲 contradicted, but Xiang Zhong won the support of Duke Hui of Qi, and killed the princes Wu and Shi. Their mother, the duchess, returned to Qi, but was unable to win support among her relatives. Prince Sui is posthumously known as Duke Xuan 魯宣公 (r. 609-591). He highly rewarded Xiang Zhong, whose descendants are known as the line Zhongsun 仲孫. His son and successor was Gongsun Gui Fu 公孫歸父, who had to take refuge in Qi after the death of Duke Xuan. Under the reign of Duke Cheng 魯成公 (r. 591-573), his son, Lu was involved in the power struggle between the states of Chu 楚 and Jin 晉. Under his reign, Lu was administered by counsellor Ji Wenzi 季文子. He is known as a person of utmost moral and incorrupt behavior. In 594 a reform of the tax system was carried out after which landowners had to pay land tax according to the size of their domains. In 590, the army was reorganized according to districts, a reform that was intensified under the dukes Xiang, who created three armies, and Zhao, who added a central batallion. Ji Wenzi's son Ji Wuzi 季武子 organised the capping ceremony of the young Duke Xiang 魯襄公 (r. 573-542) that was performed by Duke Dao of Jin 晉悼公 (r. 573-558 BCE). Under Duke Xiang's reign Confucius was born in Lu. Duke Xiang was succeeded by Prince Chou 裯, who is posthumously known as Duke Zhao 魯昭公 (r. 542-510). Prince Chou was actually a son of a concubine, but Ji Wuzi enforced his choice against the late duke's brother Mu Shu 穆叔. The relations with the state of Jin were continued, but the dukes of Jin several times behaved improperly towards Duke Zhao. Ji Wuzi's son Ji Pingzi 季平子 squandered his power in private feuds with the nobles of Hou Zhaobo 郈昭伯 (see house of Hou 郈) and Zang Zhaobo 臧昭伯 that ended with the involvement Duke Zhao into the quarrels. The Duke wanted to kill Ji Pingzi, but the Jisun family was immediately helped by the Shusun and Mengsun, the ducal army was defeated by the troops of the Three Huan lines, and Duke Zhao sought refuge in Qi. Yet he was not warmly welcomed there and therefore could not but accept to the invitation of Ji Pingzi to return. In 517 BCE, Qi occupied a large stretch of territory of the dukedom of Lu and forced Duke Zhao to reside in Qi. He was only allowed to leave Qi when Ji Pingzi bought the support of some nobles in Jin that persuaded the duke of Jin to intervene in the affair. Yet even then he was only allowed to dwell in Qianhou 乾侯 (modern Weixian 魏縣, Hebei) in Jin. Ji Pingzi thereupon asked for an audience with the duke of Jin, bare-footed and wearing mourning clothes, but Duke Zhao of Lu was not allowed to leave his prison. He finally died in Qianhou and was succeeded by his younger brother Prince Song 宋, who is posthumously known as Duke Ding 魯定公 (r. 510-495). Under Duke Ding's rule the power of the house of Jisun declined. Ji Huanzi 季桓子, son of Ji Pingzi, was overruled by the nobleman Yang Hu 陽虎, who had won the support of the state of Qi. He was made grand master (dafu 大夫) over a territory from Lu that Qi had occupied and was given the highest authority in the state of Lu. At that moment the Three Huan lines unified for a last time, defeated the troops of Yang Hu and forced him to flee the country. It is told that in 501, Confucius was able to appease the duke of Qi and to save his home country from a military invasion by Qi. Duke Ding attempted curtailing the power of the Three Huan lines, but his military leader Zhong You 仲由 was not able to enforce the destruction of Ji Huanzi's fortifications. Ji Huanzi was practically regarded as the ruler of Lu and was presented with a group of female musicians by the duke of Qi. In Confucius' eyes this present was the highest expression of the immoral attitude of his times, and left Lu, wandering around from state to state for many years. Duke Ding's successor was Prince Jiang 蔣, known as Duke Ai 魯哀公 (r. 495-467). During his reign the house of Qi fell into the hands of a sideline, the Tian family 田. In the south, the kingdom of Wu 吳 began dominating the region and enforced tribute from the state of Lu. At that time, the factual regent of Lu was Ji Kangzi 季康子. He expanded the system of field tax introduced under Duke Xuan. In the following decades, Lu lost more and more towns and villages to Qi and Wu. In 484, Confucius was invited to return to Lu and was highly welcomed. Confucius' suggestion to attack the powerful counsellor of Qi, Tian Chang 田常, was refused. In the last years of Duke Ai's reign the conflict between the ducal line and the Three Huan lines aggravated. The Duke first fled to Wei 衛, then to Zou 鄒, and finally to the new hegemonial power in the south, the state of Yue 越. Yet he was soon invited to return, but he stayed in the mansion of the family Shan 山 without ever returning to the court. The house of Lu lived on for several generations, side by side with the descendants of the Three Huan lines. Under Duke Mu 魯穆公 (r. 408-377) the ducal house was able to restore its political suzerainty over the lateral lines of the family, and Lu was even able to take part in some campaigns against Qi. The growing pressure of the state of Qin on the southern kingdom of Chu caused the latter to move towards the east. Conflicts between Lu and Chu increased. In 255 BCE, the small state of Lu was occupied by the troops of Chu. The last ruler, Duke Qing 魯頃公 (r. 273-255), died as a commoner in Keyi 柯邑. The name of the state of Lu was later used as name of princedoms. The Duke of Lu and Zhou (Lu Zhougong 魯周公, Zhou Gong Dan 周公但) Ji Dan 姬但, the Duke of Zhou, brother of King Zhou Wuwang 周武王. (Lu Zhengong 魯真公) Ji Bi 姬濞 856-826? 255 Chu 楚 occupies Lu, makes the lord of Lu ruler over the territory of Ju 莒. 249 Lu destroyed by Chu. Shiji 史記, 33, Lu Zhougong shijia 魯周公世家. Luo Shilie 羅世烈 (1992). "Lu 魯", in Zhongguo da baike quanshu 中國大百科全書, Zhongguo lishi 中國歷史 (Beijing/Shanghai: Zhongguo da baike quanshu chubanshe), Vol. 2, 622-623.